Richard the Good as part of the "Six Dukes of Normandy" statue in the town square of Falaise. 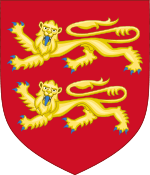 Richard II (23 August 963 – 28 August 1026), called the Good (French: Le Bon), was the eldest son and heir of Richard I the Fearless and Gunnora. He was a Norman nobleman of the House of Normandy. 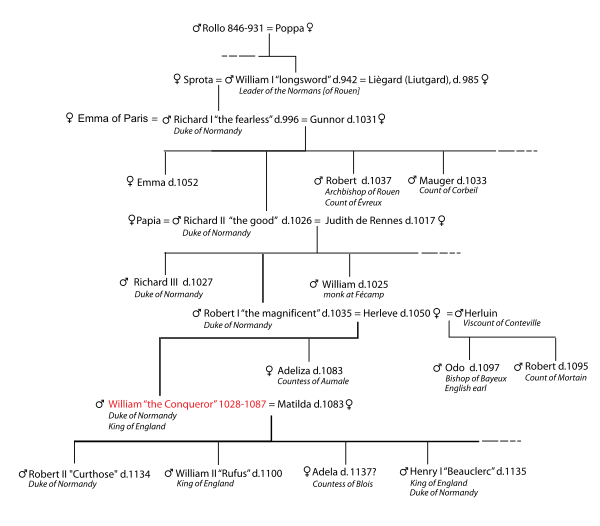 Richard succeeded his father as Duke of Normandy in 996. During his minority, the first five years of his reign, his regent was Count Rodulf of Ivry, his uncle, who wielded the power and put down a peasant insurrection at the beginning of Richard's reign. Richard had deep religious interests and found he had much in common with Robert II of France, who he helped militarily against the duchy of Burgundy. He forged a marriage alliance with Brittany by marrying his sister Hawise to Geoffrey I, Duke of Brittany and by his own marriage to Geoffrey's sister, Judith of Brittany. In 1000-1001, Richard repelled an English attack on the Cotentin Peninsula that was led by Ethelred II of England. Ethelred had given orders that Richard be captured, bound and brought to England. But the English had not been prepared for the rapid response of the Norman cavalry and were utterly defeated. Richard attempted to improve relations with England through his sister Emma of Normandy's marriage to King Ethelred. This marriage was significant in that it later gave his grandson, William the Conqueror, the basis of his claim to the throne of England. This proved to be beneficial to Ethelred when in 1013 Sweyn Forkbeard invaded England. Emma with her two sons Edward and Alfred fled to Normandy followed shortly thereafter by her husband king Ethelred. Soon after the death of Ethelred, Cnut, King of England forced Emma to marry him while Richard was forced to recognize the new regime as his sister was again Queen. Richard had contacts with Scandinavian Vikings throughout his reign. He employed Viking mercenaries and concluded a treaty with Sweyn Forkbeard who was en route to England. Richard II commissioned his clerk and confessor, Dudo of Saint-Quentin, to portray his ducal ancestors as morally upright Christian leaders who built Normandy despite the treachery of their overlords and neighboring principalities. It was clearly a work of propaganda designed to legitimize the Norman settlement, and while it contains numerous historically unreliable legends, as respects the reigns of his father and grandfather, Richard I and William I it is basically reliable. In 1025 and 1026 Richard confirmed gifts of his great-grandfather Rollo to Saint-Ouen at Rouen. His other numerous grants to monastic houses tends to indicate the areas over which Richard had ducal control, namely Caen, the Éverecin, the Cotentin, the Pays de Caux and Rouen. Richard II died 28 Aug 1026. his eldest son, Richard becoming the new Duke. Matilda (c. 1013/5), nun at Fecamp, d. 1033. She died young and unmarried. ↑ Cassandra Potts, Monastic Revival and Regional Identity in Early Normandy, (The Boydell Press, 1997), 27.